It feels like just yesterday that I was celebrating my first Mother’s Day with my one and only little girl. She was only 3 months old at the time and I felt so proud to finally take on the special role most woman dream of. Eight years later and I’m still head over heels in love with being a mom. It may be one of the most challenging jobs, full of hair pulling moments and utter exhaustion, but no one ever said raising a human from scratch would be effortless. Being a parent is hard work, often relentless to say the least. But on this annual holiday I’m always reminded that it’s all worth it. My daughter has blossomed into a compassionate, kind, and thoughtful person. Could it get any better? I’m already winning! Last year was probably my favorite Mother’s Day because Toodie took it upon herself to recruit the help of my own mom to surprise me with breakfast in bed. She beat the eggs, buttered the toast, and even carried the tray carefully to my room. We sat together for a while, snuggling and watching morning cartoons, drinking orange juice from fancy glasses. It’s a memory I will always cherish, one that can never compare to a bundle of flowers or store-bought card. 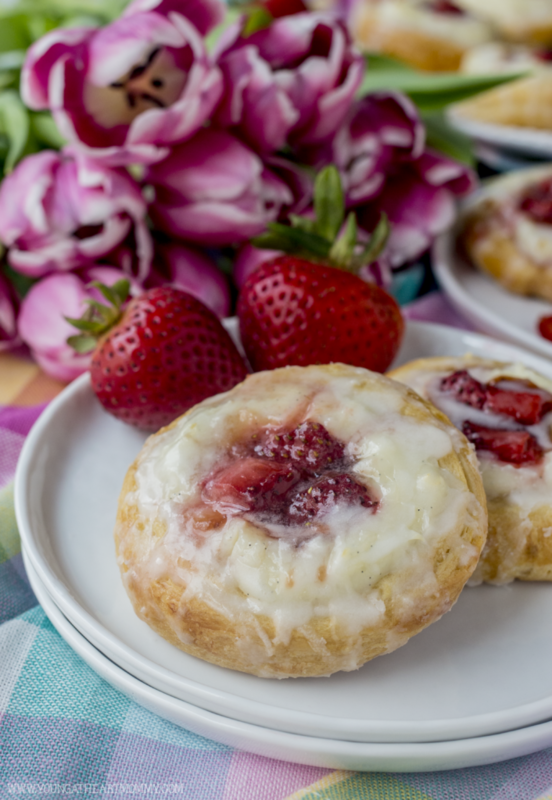 Whether your mom is big on breakfast or more of a brunch kinda gal, create a little magic in the kitchen on the morning of Mother’s Day. 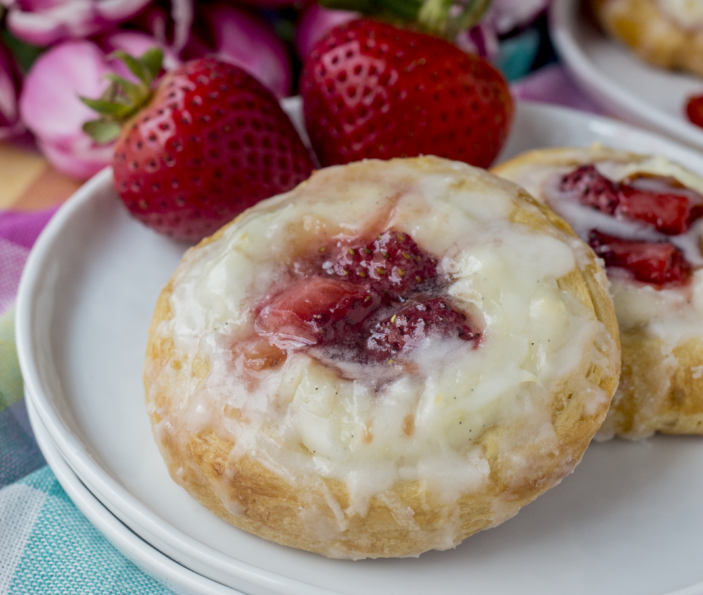 These delicious Strawberry Cream Cheese Danish pastries can be made fresh in under 15 minutes. Add them to the menu and serve warm to satisfy her sweet tooth. 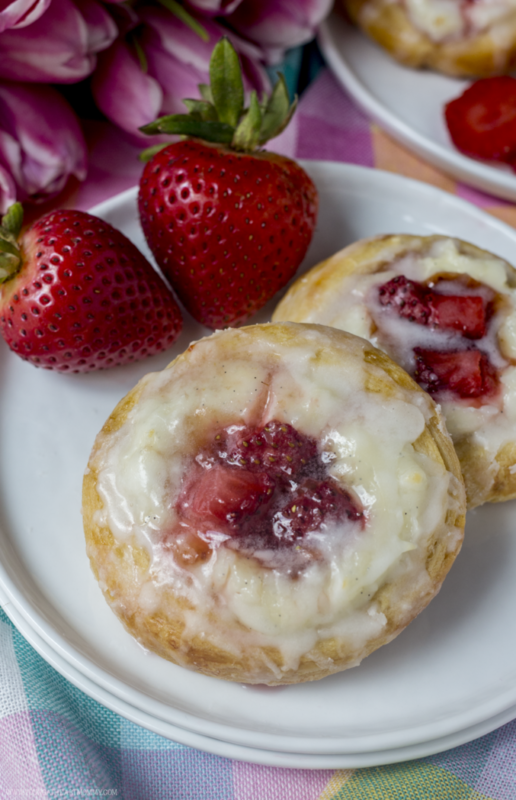 The mixture of vanilla bean cheesecake filling and fresh strawberries is delectable. 8 oz. package of cream cheese softened to room temp. Keep crescent dough in the shape of a log. Slice into pieces, about 3/4 inches thick. This should yield 8 pastries. Line a baking sheet with parchment paper or a silicone mat. Line with dough and use your fingers or a small medicine cup to create an indentation in the center of each. The dip should be deep enough to hold cream cheese filling. Sprinkle a small amount of brown sugar into each hole. In a large mixing bowl combine granulated sugar, cream cheese, sour cream, and vanilla bean seeds. Beat until creamy. Transfer a generous dollop of filling into each danish. Add a tsp. of preserves and spoonful of diced strawberry pieces. Brush edges of pastries with a light egg wash. Bake for 15 minutes or until dough appears lightly golden brown. Remove and allow to cool while making icing. In a clean bowl mix confectioner’s sugar, milk, and softened butter. Whisk together until smooth. If too thick, add more milk until desired consistency is achieved. 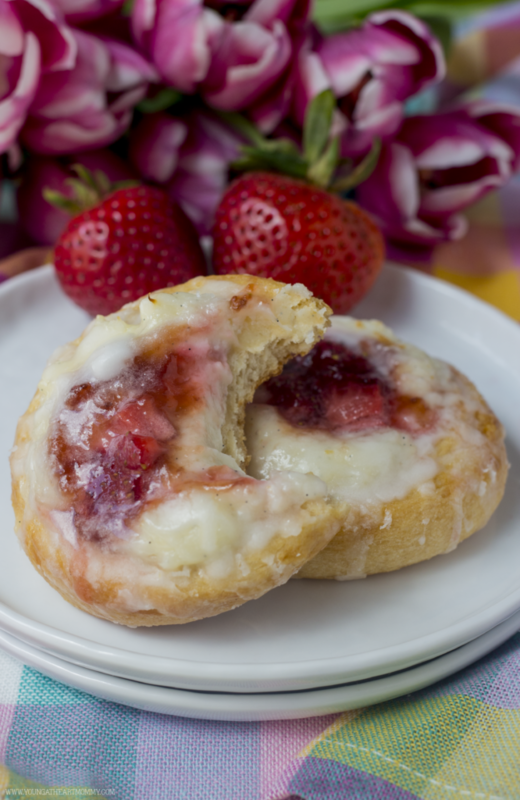 Drizzle on top of each danish and enjoy! 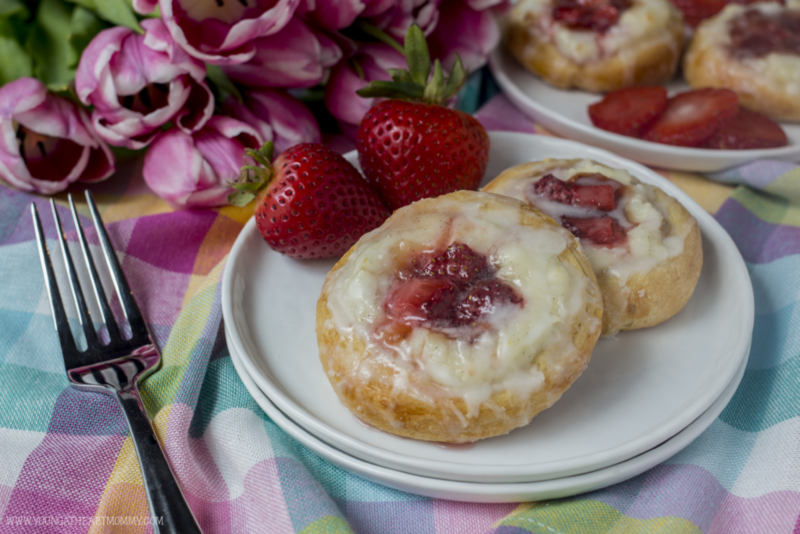 You’re sure to win mom’s heart with this recipe! All of the ingredients needed can be found at your local Whole Foods Market. They have a variety of flowers and gifts to help make her day extra awesome. From bunches of blooming tulips to body lotions and frothy bath bombs, choosing the perfect way to say “I Love You” should be easy. What do you have planned for Mother’s Day this year? I have to give these a try. I usually buy them in the supermarket but now I can make my own. Thanks for the recipe.